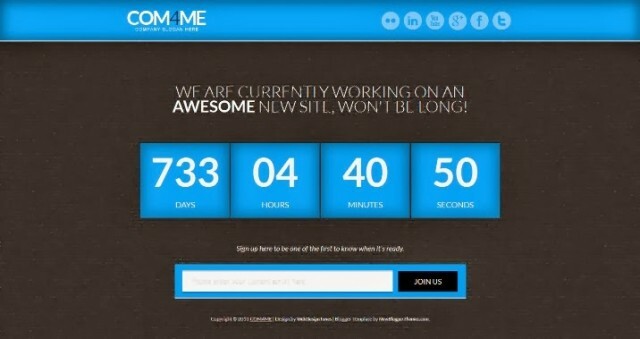 Best Collection of Free Blogger Coming Soon & Under Construction Templates. COM4ME is a Under Construction Blogger Template. Features are 6 theme colors option, 1 Column, Adapted from WordPress, Fixed width, Responsive, Web 2.0. Holding Pattern is a Under Construction Blogger Template. Features are 1 Column, Adapted from WordPress, Artworks, Brown, Elegant, Fixed width,No Sidebar, Web 2.0, White. Supersized Under Construction is a free blog template with type : Black, Elegant, Fixed width, Fresh, Grey, No Sidebar, White. Wp Launcher black is black version of Wp Launcher blogger template, which is suitable for “Under construction” blogs. 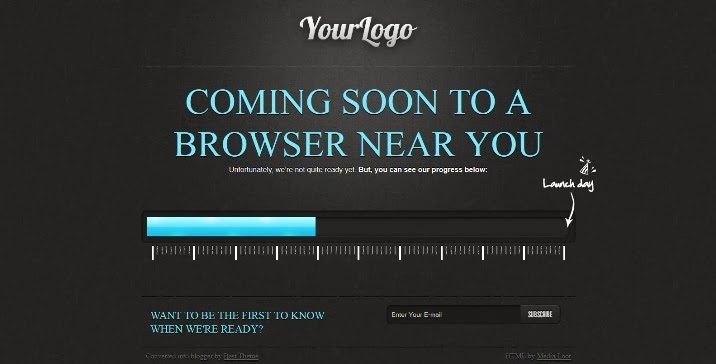 Has a countdown timer , share buttons and a Feedburner email subscription box to allow users to stay update with your site launch. 1 Column, Adapted from WordPress, Elegant, Fixed width, Fresh, Gray, Minimalist, No Sidebar, Under Construction, Web 2.0, White. Wp Launcher is another beautiful blogger template, which is suitable for “Under construction” blogs. Adapted from WordPress, Blue, Fixed width, No Sidebar, Under Construction, White. Ice Breaker Green is one of the template “Ice Breaker” templates collection. It is suitable for under construction blogs. It is included feedburner email subscribe widget and also RSS and Twitter buttons. This template has fast loading time and very easy to configure. Your visitors can keep updated with your site start with subscribing through Feedburner. WP Blueprint is another simple blogger template, which is suitable for “Under construction” blogs. 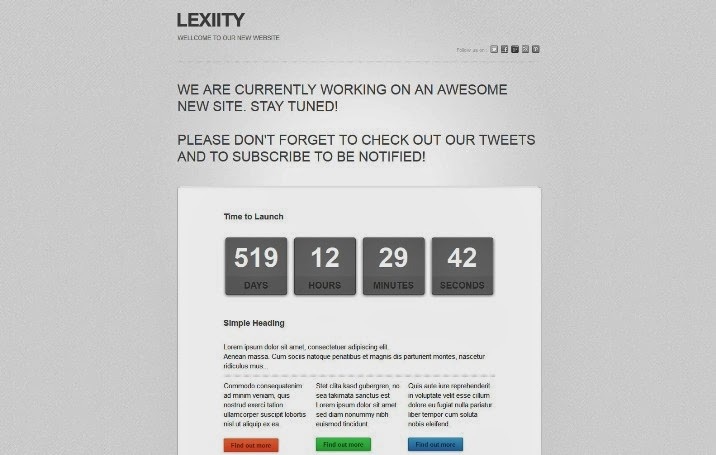 Has a countdown timer , a Twitter widget and a Feedburner email subscription box to allow users to follow your progress. My blue construction is a free blog template with type : Adapted from WordPress, Blue, Fixed width, No Sidebar, Under Construction. Ice Breaker is suitable for under construction blogs. It is included feedburner email subscribe widget and also RSS and Twitter buttons. This template has fast loading time and very easy to configure. Your visitors can keep updated with your site start with subscribing through Feedburner. UnderConstruct blogger template can be used for redirection if any maintenance is going on your blog. For redirection read my article Redirect your blog or any post to some other page. 1 Column, Adapted from WordPress, Fixed width, Fresh, Grey, No Sidebar, Orange, Responsive, Under Construction, Web 2.0, White. Coming Soon Under Construction Blogger Template is another beautiful Under Construction blogger template which is modified and converted from WordPress template. “Ice Breaker Red” is one of the template “Ice Breaker” templates collection. It is suitable for under construction blogs. It is included feedburner email subscribe widget and also RSS and Twitter buttons. This template has fast loading time and very easy to configure. Your visitors can keep updated with your site start with subscribing through Feedburner. A simple Blogger template for under construction blogs. Ready2Launch is a free blogger template custom design with 1 Column, Blogger, Gray, Green. 1 Column, Adapted from WordPress, Black, Fixed width, Grey, No Sidebar, Under Construction, Web 2.0, White. This is an under-maintenance template powered by blogger. It can be used for redirection if any maintenance is going on your blog. For redirection read my article Redirect your blog or any post to some other page. Under Construction Blogger Template is a simple under construction blogger template.Easy to use, easy to manage, as simple as a click. Its been some while that I didn’t launch any blogger template after Under-Construct. This is my new blogger template named Workin brother of Under-maintenance and Under-Construct. It can be used for redirection if any maintenance is going on your blog. For redirection read my article Redirect your blog or any post to some other page. BeBack Blogger Template is a simple under construction blogger template.Easy to use, easy to manage, as simple as a click. BeBack Under Construction is a free blogger template custom design with 1 Column, Blogger, Fixed, Gray, Under Construction, Unique. Check faber chimney service center in jaipur and www.customerservicecenterjaipur.com for more info. The color choice is amazing.